Advances in computational methods have created exciting new opportunities to apply digital methods not only to historical and philosophical research, but also to discovery and meta-analysis in the life sciences. 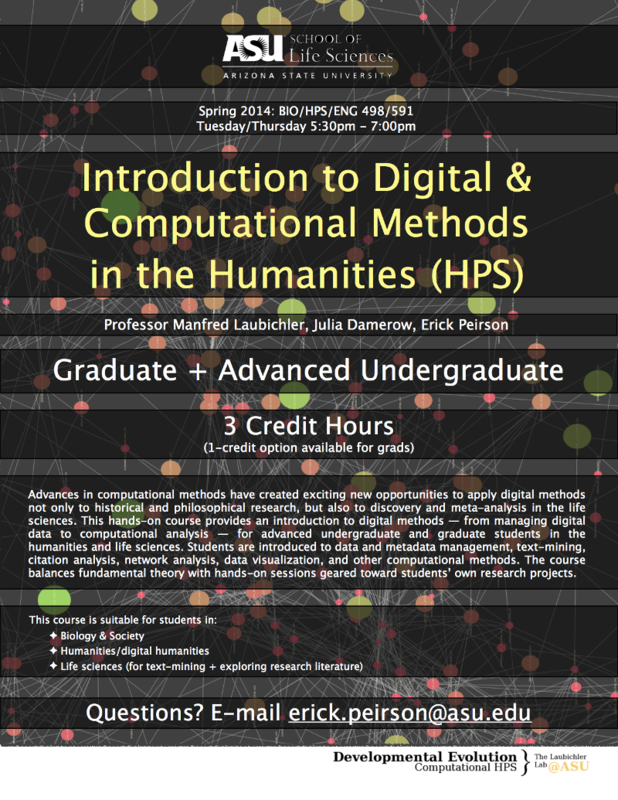 This hands-on course provides an introduction to digital methods — from managing digital data to computational analysis — for advanced undergraduate and graduate students in the humanities and life sciences. Students are introduced to data and metadata management, text-mining, citation analysis, network analysis, data visualization, and other computational methods. The course balances fundamental theory with hands-on sessions geared toward students’ own research projects. This course is suitable for students in both the sciences and the humanities, and is cross-listed for Biology, History & Philosophy of Science, and English. For more information, contact Julia Damerow or Erick Peirson.